Focus on Sales, Close more business deals! Attract, retain, and delight more customers. Grow your company into a customer-focused organization. 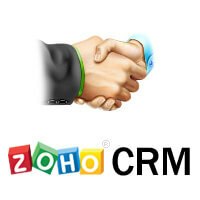 CRM gives you a 360 degree view on your complete sales cycle. Helps you concentrate on generating sales by simplifying processes such as Lead generation and qualification, Pipeline Analysis, Sales stage and probability analysis, Competitive analysis, Sales forecasting and Quota Management onto a single platform across your Organizational Departments.